ATI recently released the updated Radeon 9600 and 9800 XT models, and I thought it might be a good idea to compare the new 9800 XT to the original 9800 Pro to see if the upgrade was worth the money. The 9800 XT in many ways is really just an overclocked 9800 Pro. The default speeds on the 9800 Pro are 378MHz on the engine and 338 on the memory. 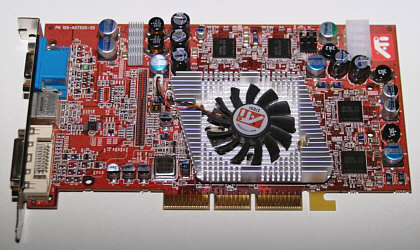 The XT improves this by adding a huge copper heat sink that covers the front and back of the card, with speeds boosted to 412MHz on the engine and 365MHz on the memory. The two cards look quite different, and the XT weighs about twice as much due to the massive copper heat sink. Unlike the NVidia 5900/5950, the XT only takes up one slot in your computer case. I started with good old 3D Mark 2001se to take a look at DX 7 performance. The results here don't look too great for the XT, with insignificant increases over the Pro model. So how about 3D Mark 2003? Now that's a bit better, with about a 10% performance boost across resolutions. This is what I expect from an overclocked video card. Next we move on to CodeCreatures, which really pushes the polys on the screen. Here we see some really substantial improvements over the Pro version, boosting the fps at 1280 from 35fps to over 45fps, which is more than 20%. But what about games? I thought I'd take a look at UT 2003 to see if there was a difference between the two cards. The answer is no. The differences aren't worth an ice cube at the North Pole. How about overclocking the card above the manufacturer's specs? ATI offers an "overdrive" feature with the Catalyst 3.10 drivers, so I compared that to manual overclocking with Powerstrip using 3D Mark 2003. You'll want to compare the bars of the same color with each other at the 3 resolutions. The overdrive did virtually nothing to the benchmark scores, whereas pushing the speeds to 424 core and 390 memory did offer a very slight improvement. I played Desert Combat at these settings, and the system spontaneously rebooted after about 30 minutes. Dropping the memory speed to 380 fixed this overclocking-related problem. Conclusions: ATI is making some great video cards now, but they've about reached the end for this particular chip line. I thought having the memory running 50MHz faster than the pro would make more of a difference than it did. 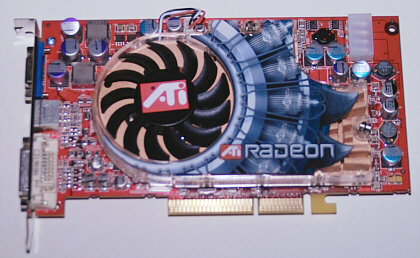 I'll be interested to see how the next line of ATI's video cards perform. Bottom line, if you have a good video card now, don't buy an XT.